Philadelphia, Pennsylvania has one of the highest crime rates in the country. With a history of drug distribution, and present opioid crisis, it should come as no surprise that the city has one of the highest rates of violent crime in the country. In Philadelphia, after industry crumbled in the mid-20th century, many residents turned to selling and eventually using drugs, as a means to escape their situation. And although the economic situation is not the same as it was in the mid-20th century, the dysfunctional patterns of use and distribution have continued up to the present time. In one of the neighborhoods most affected by the sale and use of heroin and cocaine, Kensington, a safe-injection site for opioid users is being planned, where medical volunteers can stand by to administer an antidote to people who are overdosing. This is a good first step for harm reduction, but the root problem goes a lot deeper. Addiction in Philadelphia is the result of crime, it’s the result of doctors prescribing opioids when they shouldn’t, and it’s the result of widespread poverty, among other things. Over one quarter of Philadelphia’s population lives under the poverty line, which means that Philadelphia has the highest poverty rate in the U.S., among America’s largest cities. And in Philadelphia, just like the rest of the world, poverty and drug addiction are two sides of the same coin. If you live in Philadelphia, and have fallen victim to substance abuse don’t hesitate to seek treatment. There are enormous resources in at your disposal. Crack and heroin are widely sold in Philadelphia, and addiction to the drugs is prevalent. The sale of these drugs fosters violence, which results in an environment that’s dangerous as well as poor. To escape these problems, drug use is the solution for many people. It’s the solution that’s responsible for the problem, and worsens community problems even more. However violent Philadelphia is, and it certainly is violent, last year overdoses resulted in four times as many deaths as homicides. In 2017, 1,200 people died of overdoses. The main problem is opioids. Doctors prescribe them when they shouldn’t. People get addicted to prescription opioids. When the addiction to prescription opioids has set in, heroin offers a cheaper alternative. An addiction to pain medication can result in heroin addiction, in this way. Addiction is a dangerous place to be in. Philadelphia can be a dangerous place to be in. But there is a way out. Addiction treatment offers a solution. 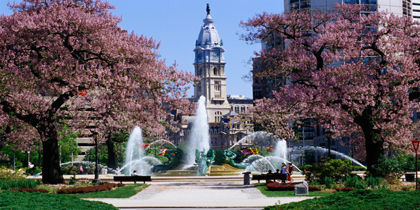 Philadelphia is the largest city in the state of Pennsylvania and the sixth biggest city in the United States. Over 1.5 million people live in the city itself, with the surrounding Delaware Valley having a population of 7.2 million. Philadelphia is an important commercial, industrial and educational hub that features the eighth largest metropolitan economy in the country. Despite its wealth and status, however, Philadelphia struggles with a number of substance abuse problems. Some neighborhoods in the city are facing a massive opioid drug epidemic that continues to kill people and seems to get bigger every day. Prescription opioids and other prescription drugs are a huge problem in the city, as is PCP, heroin, and synthetic cannabinoids. There are a number of detox and rehab clinics across Philadelphia to help people in need, along with a growing number of aftercare programs and sober living houses. The population of Philadelphia grew slightly to just over 1.5 million in the 2016 census, after having declined greatly from a record high of over 2 million people in 1950. The long decline in Philadelphia’s population has been associated with an increase in poverty and crime in some parts of the city, which is only now starting to grow again. According to official figures from the United States Census Bureau, the racial composition of Philadelphia is 41 percent African American, 36 percent White, 13 percent Hispanic or Latino, and 7 percent Asian. The number of Black people in the city, including Black Hispanics, has increased from 33.6 percent in 1970 to 42.8 percent today. In contrast, the number of White residents, including White Hispanics, has dropped dramatically from 65.6 percent in 1970 to 41.7 percent today. The median household income in Philadelphia was $36,836 in the latest 2013 Census Bureau data, with the median household income of metropolitan areas much higher at $60,482. The severe wealth disparity in Philadelphia has been associated with substance abuse and addiction in certain parts of the city. For example, while residents living in Society Hill had a median household income of $93,720, some of North Philadelphia’s poorest districts reported household income levels as low as $14,150. Not only do people in poor areas face more problems with drug abuse and dependence, they are find it harder to access drug treatment services. The illegal street drug heroin continues to cause huge problems across Philadelphia, as do prescription opioids such as oxycodone and hydrocodone, synthetic cannabinoids, and the re-emergence of PCP. Opioid drugs include the addictive street drug heroin and a range of prescription medications such as codeine, fentanyl, oxycodone, and hydrocodone. The Kensington neighborhood in Philadelphia is just one example of area that has been hit hard by the opioid epidemic, which stretches across the United States and is responsible for more overdose deaths than ever before. According to official income statistics, more than half of the population in Kensington live below the poverty line, a rate that is 2.5 times higher than the rest of Philadelphia. Cheap and powerful heroin continues to flood the streets in this part of the city, with fentanyl and other potent prescription opioids often added to heroin to increase the perceived effects. There were over 900 overdose deaths in Philadelphia in 2016 alone, many of which were related to opioid drugs. According to City officials, these numbers are only likely to go up in coming years. The situation has become so bad that drug overdose deaths are now the number one cause of death in Philadelphia for every single age group between 25 and 44. They are also the number two cause of death for people aged between 45 and 54, and the number three cause of death for those aged between 55 and 64. Professional drug treatment services are needed in Philadelphia now more than ever before, including affordable and accessible medical detox clinics, inpatient and outpatient rehab, and aftercare support services. If you or anyone you know is living with drug abuse or addiction, it’s important to get help as soon as you can. Drug abuse affects people in a variety of different ways, from social and financial problems through to health complications and overdose. While many of the signs of drug abuse are dependent on the specific substance being abused, there are some general warning signs to look our for. Addiction is defined as a brain disorder that involves compulsively engaging in rewarding stimuli despite the existence of negative consequences. For example, drug addicts continue to use drugs even when these substances are known to cause problems. While addiction is always characterized by psychological factors such as reward and reinforcement, it is not always accompanied by physical dependence. For example, it is possible for someone to become physically dependent on medications without developing an addiction. It is also possible for someone to become addicted to a drug such as methamphetamine that does not produce physical withdrawal symptoms when drug use is stopped. Drug addiction exacts a high toll on American society, with professional treatment often required to break the bonds of addiction and support long-term recovery. Opioid drugs include the naturally occurring opium alkaloids codeine, morphine and thebaine, along with a number of synthetic and semi-synthetic derivatives. Opioids are taken medically for pain relief purposes and abused recreationally to induce feelings of transcendent euphoria and relaxation. The illegal street drug heroin has become a huge problem in Philadelphia and all over the United States, where it causes physical dependence and addiction on a grand scale. The abuse of prescription opioids has also become a huge problem over the last few years, with substances such as oxycodone and fentanyl responsible for more drug overdose deaths than ever before. All opioid drugs are capable of causing physical dependence, a state recognized by the experience of a physical-somatic withdrawal syndrome when drug use is stopped or reduced. Because opioid withdrawal can be so dangerous, medical detox is often needed to help treat withdrawal symptoms before they create additional problems. Treatment for heroin and opioid addiction is a long and gradual process, with rehab clinics in and around the Philadelphia area specializing in medication and psychotherapy programs that help people break the bonds of addiction. Before receiving treatment for a substance use disorder, it’s important to differentiate between psychological and physical dependence. Psychological dependence involves emotional-motivational withdrawal symptoms when drug use is discontinued, including things such as lack of motivation, feelings of unease, anxiety, and an inability to experience pleasure. Drugs known to cause psychological dependence include marijuana, methamphetamine, prescription opioids, and alcohol. In contrast, physical dependence is associated with physical-somatic withdrawal symptoms, including but not limited to body cramps, excessive sweating, hallucinations, and seizures. Drugs that cause physical dependence include alcohol, heroin, prescription opioids, and prescription benzodiazepines. While drugs that cause physical dependence also cause psychological dependence in most cases, the opposite is not true. When it comes to treatment, physical dependence requires medical detoxification followed by rehab, with psychological dependence often treated through rehab alone. Before being admitted into a drug treatment clinic, people need to be assessed by a doctor or qualified therapist. This initial assessment plays an important role in the treatment provided, including the type of treatment, the length of treatment, the use of medications during treatment, and whether or not patients can access outside support services. Some of the things looked at during assessment include the type of drug being abused, the length of abuse, the extent of abuse, the existence of mental health problems, the existence of dual diagnosis, co-occurring behavioral addictions, family structure, history of crime and violence, and ability to interact with follow-up treatment services. Practitioners will attempt to identify broader life issues and identify high-risk situations in order to set up the best treatment plan possible for each patient. While self-assessment can play an important role during this process, it’s critical to engage with a professional before deciding on a treatment structure. During pre-intake, patients in Philadelphia will be prioritized according to their immediate needs. For example, people with alcohol or opiate problems may need to access medical services right away in order to avoid dangerous withdrawal symptoms. Others who are facing problems with marijuana or MDMA may need to wait before they can receive treatment. Additional life complexities may also come into play during this process, including mental health status, dependent children, justice system responsibilities, homelessness and other factors. The specific intake procedure used is dependent on the treatment center in question, with some treatment clinics adhering to the disease model of addiction and others adhering to the free will model of addiction. This can have a huge effect on the treatment provided, especially if people want to engage with traditional 12-step support programs or other forms of faith-based treatment. Once the intake process is complete, people will either be admitted into a medical detox program or admitted directly into residential or outpatient rehab. Detoxification describes the process and experience of drug withdrawal under medical supervision. While detox is not always needed, it is commonly used to treat physical dependencies such as alcoholism, heroin addiction, opioid addiction, and benzodiazepine addiction. According to the National Institute on Drug Abuse (NIDA), effective detox requires a three stage process: evaluation, medication, and helping patients into further treatment. During evaluation, detox patients will be put through a number of physical and psychological tests to ensure they are ready to engage with a medication regime. For example, if certain psychoactive drugs are found in blood tests, it may not be possible to administer central nervous system (CNS) depressants such as Valium or Xanax. The mental health of the patient will also be analyzed at this stage to see how they are likely to handle the withdrawal syndrome. The second stage of detox involves stabilizing the patient through the use of appropriate medications. While rapid detox programs and other “cold turkey” methods can prove useful in certain situations, they can be incredibly dangerous and are typically not advised. Once the patient is stable, they will be guided towards a residential or outpatient rehab program. Medications are normally limited to the detox phase of drug treatment, with rehabilitation focused on psychotherapeutic methods that address the precedents of addiction. There are many exceptions to this rule, however, with physical drug dependencies often needing long-term medical support. For example, alcoholics may be prescribed benzodiazepine medications such as diazepam over a long time period, along with drugs such as acamprosate, disulfiram and naltrexone. Heroin and prescription opioid addicts may also be medicated over a period of weeks or months, with some people medicated indefinitely as a form of harm reduction. For example, methadone and buprenorphine are often given to heroin addicts as a form of opiate replacement therapy, with these drugs administered to help manage addiction rather than supporting abstinence. While opiate replacement therapy has received criticism for enabling secondary addictions, it has proved useful in managing addictive behaviors and helping people get better health and employment outcomes. Rehabilitation is the cornerstone of effective drug addiction treatment. While detox is designed to support drug withdrawal in a safe and effective manner, it does very little to address the emotional and social problems that surround addictive behavior. Rehab provides people with the skills and support they need to change negative behavior patterns and address emotional problems without resorting to substance abuse. While some forms of rehab rely on medication therapy, most programs are based on behavioral, cognitive, and motivational therapy. Rehab programs attempt to break psychological dependencies through therapy, counseling, and 12-step support systems. From client-centered approaches through to traditional psychoanalysis, rehab attempts to change lives by giving people new skills and upgrading their emotional tool set. Behavioral therapy plays a critical role during rehab, including family therapy, motivational incentives, contingency management, and cognitive-behavioral therapy. Individual treatment plans may utilize a combination of these treatment paradigms, including art therapy, music therapy, animal therapy, moral reconation therapy and many others. Behavioral therapy is a broad term applied to a wide spectrum of psychotherapeutic techniques, including behavior management, covert conditioning, habit reversal training, behavior modification, observational learning, emotional modeling and many others. This form of therapy is central to many rehabilitation programs because it focuses on practical principles and objective treatment outcomes. By teaching drug addicts how to recognize problematic emotional and cognitive patterns as they occur, behavioral therapists can teach people how to avoid many of the unwanted impulsive and compulsive actions associated with drug abuse. Rehab is available throughout Philadelphia, from short-term outpatient programs through to intensive residential retreats. Residential rehabilitation (RTC) is the most comprehensive treatment option, with programs lasting anywhere from a couple of weeks to six months. While this form of treatment can be more expensive and less flexible than other options, it provides total immersion in the treatment environment and around-the-clock access to medical support staff. RTC is ideal for people with a long history of drug addiction and those recovering from physical drug dependencies. Partial hospitalization (PHP) is another treatment alternative, with these programs normally available for five days each week. PHP allows patients to go home over the weekend and catch up with fiends and family members. While not as immersive as RTC, PHP patients can still access medications and support staff during the week if needed. Intensive outpatient rehab programs (IOP) provide the most affordable and least immersive option, with patients generally living at home or at a sober living environment for the duration of treatment. According to the National Institute on Drug Abuse (NIDA), almost 50 percent of all rehab patients return to drug or alcohol use following the completion of a formal treatment program. In order to reduce this rate, patients should always go through an exhaustive relapse prevention program. Relapse is also known as recidivism, with this term describing a return to past drug use following a period of abstinence. Because drug addiction is based on brain changes supported by reinforcement and reward, specific measures are needed to break addictive cycles. Relapse prevention programs attempt to teach people how to recognize triggers, avoid unwanted emotional responses, and deal with negative life events through positive behavior patterns rather than drug use. During relapse prevention programs, therapists will highlight many of the emotional and mental signs that can lead to a physical relapse event. Common triggers include anger, frustration, environmental cues, social events, anxiety, and interaction with old friends. Mindfulness can play a crucial role in this process, with some treatment centers specializing in meditation and related techniques. Overcoming a substance use disorder takes time, commitment, and ongoing support. While detox is crucial for managing the withdrawal syndrome and rehab helps people to address the psychological precedents of addiction, by themselves they are not enough. Ongoing aftercare programs are always recommended in the weeks, months, and years that follow treatment, with some people receiving continuing care for an indefinite time period. Aftercare programs differ widely according to the needs or each patient, with common programs including Alcoholics Anonymous (AA), Narcotics Anonymous (NA), other 12-step support groups, counseling, family therapy, and ongoing behavioral therapy programs. Aftercare programs are often available through rehab centers, with independent church bodies and charity groups also offering aftercare in some areas. Because relapse is such a common outcome of drug addiction, aftercare programs are needed to ensure long-term abstinence. Sober living describes a special accommodation arrangement made after the completion of formal rehabilitation. Sober living houses (SLHs) are also known as sober living environments or sober living homes, with these facilities able to help people make the important transition from drug addition treatment back to everyday life. Sober living homes are available in Philadelphia and across the United States. Most SLEs operate under a strict set of rules and guidelines, with many places governed by a Sober Living Coalition or Sober Living Network. While rules differ from place to place, there are some general rules that all house guests need to abide by in order to receive ongoing accommodation and support services.